Want to send your kid to college? Tuition is going to cost more, even at a public university. 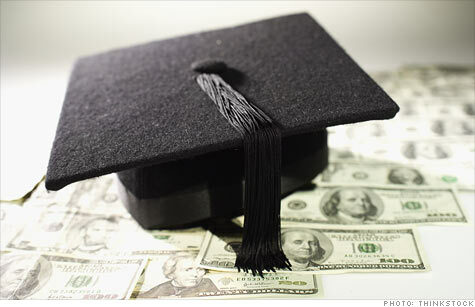 NEW YORK (CNNMoney) -- Although more Americans are getting help from scholarships and tax breaks, the net cost of college is eating up a higher share of the typical family's income in 2011, according to a report released Wednesday. Many campuses, however, had increases that were drastically higher. California State University San Marcos posted the highest percentage increase in the country by raising tuition and fees by 31% to $6,596, according to Collegedata.com. The University of New Hampshire hiked its tuition 11.5% to $15,250, giving New Hampshire the most expensive public college system in the country. 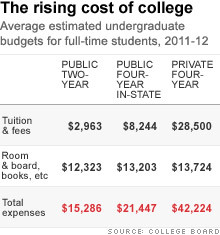 The sticker price of living and studying for a year at a typical private college rose 4.3% to $42,224 this year. There were a few nuggets of solace for students and parents in the report.  While community college tuition posted a sharp 8.7% gain, it's still a bargain: only about $3,000 a year for full-time tuition.  Recent increases in federal grants and tax benefits raised average total aid above the average tuition price of community colleges. Thus, the typical community college student got the cost of tuition and most textbooks fully covered.  Fewer than 12% of private college students pay those schools' high sticker prices. Fully 88% of all freshmen at private universities received scholarships to reduce their costs, according to a recent survey by the National Association of College and University Business Officers. Private college students receive, on average, $15,530 in scholarships and federal tax benefits, reducing their average net cost to $26,700, the College Board found.  Fewer than half of all public university students pay the full sticker price to attend. Federal surveys show at least 52% of all students at public four-year universities receive scholarships or grants. Aid, not counting loans or campus jobs, brought the net tuition paid by the average student at a typical public university to about $2,500, the College Board estimates. That brings the total average net cost of a year on campus (including dorm, books, travel and living expenses) to $11,400. Unfortunately, since family incomes have been falling for the last three years, even these lower net prices are taking up a higher percentage of most families' incomes, says Sandy Baum, an economist who is the lead author of the College Board's report. Low- and middle-income families are getting squeezed because many colleges and states have shifted financial aid dollars into "merit" programs to attract top students more likely to come from higher income families. How much will that college really cost? And there's no immediate relief in sight: "College is more expensive this year than last, and it is probably going to get more expensive next year," Baum says. The only way for people to get the college education they need, says Baum, is to shop smartly for an affordable degree. But rather than picking a college with the cheapest sticker price, says Baum, a better strategy is to seek out colleges with an affordable net price. To help families figure out what colleges' true costs are, MONEY has created a calculator that shows the magazine's estimated cost of both one year and four years at almost every four-year college and university in the US. The estimated costs returned by the calculator are based on the net prices colleges report for families within standard income bands: $0-$30,000 a year, $30-$48,000 a year, $48-$75,000 a year, $75-$110,000 a year and above $110,000 a year. Should I consolidate my student loans into one big loan?